Here are our Frequently Asked Questions about the MedPage Today PriceCheck partnership, creating a database of cash or self-pay prices for health care. If you have other questions, email us at info@clearhealthcosts.com or e.chu@medpagetoday.com, and we’ll add the question and answer to this page. Q. What price do you want? When you say “cash or self-pay price,” that might be the Chargemaster price, or it might be a prompt-pay discount price, or anything like that. A. Whatever the cash or self-pay price is, for an uninsured patient or one who’s not on your insurance plan. Q. What data do I supply? A colonoscopy might include a bill from the gastroenterologist for the procedure, from the facility, from the anesthesiologist, and from the pathologist. Should I add all of these together as the “total cost” of the procedure? Or are you only collecting data on what the gastroenterologist charged for the procedure? A. We are most interested in the “all-in” price. Think of the patient or consumer – or, as we like to call them, people. Ideally, use the total prices charged, then specify a breakdown of other charges in the notes: that would be the best way for us to build a useful data set. We try in every case to get that “all-in” price, for a cash or self-pay patient, though it’s not always available in advance. If you’re not sure we want it, here’s your answer: yes, we want it. Detail is good! Q: Why should doctors and other clinicians care about this? The only thing that matters is what we’re reimbursed. A: We hear a lot about how doctors think their treatment plans are affected by money: a person who can’t afford medications, for example, might go without, or a person who can’t afford a deductible will skip care. Some of this is documented in articles and studies like this one and this one, and some has probably walked up to many providers in their offices. People are hungry for health cost information, as this study found, and if we can give it to them, that makes their lives easier. At Clearhealthcosts.com, we’re a journalism startup bringing transparency to the health care marketplace by telling people what stuff costs. We have noticed increasingly that patients and their providers are allied over the issue that money should not get in the way of treatment. And so, we here at Clearhealthcosts.com and our partners at MedPage Today devised this partnership, to develop that natural alliance. Joining hands together, we think, there’s a way to solve this problem. Q: The procedure descriptions are confusing. There are a lot of things named “colonoscopy” on this list. Which one am I supposed to pick? A. Use whatever your practice provides. If you’re entering prices as a patient, pick the most common five-digit code like 77057 or an alphanumeric code like G0202. That’s the closest description used in the medical system to standardize procedure identification, and if providers and patients are speaking the same language, that’s good. For more about the numbers, here’s a blog post. Not every bill has these same codes on it; some have only verbal descriptions. We do understand how confusing and annoying this can be from the perspective of someone who is not a professional coder or biller. For example this search, for a bunion procedure, produces multiple confusing results because of the CPT/HCPCS code issue. When we had data from a provider, we chose to use the terminology they picked, rather than imposing some other code. Want to know more about how complicated medical coding can be for just this one procedure? 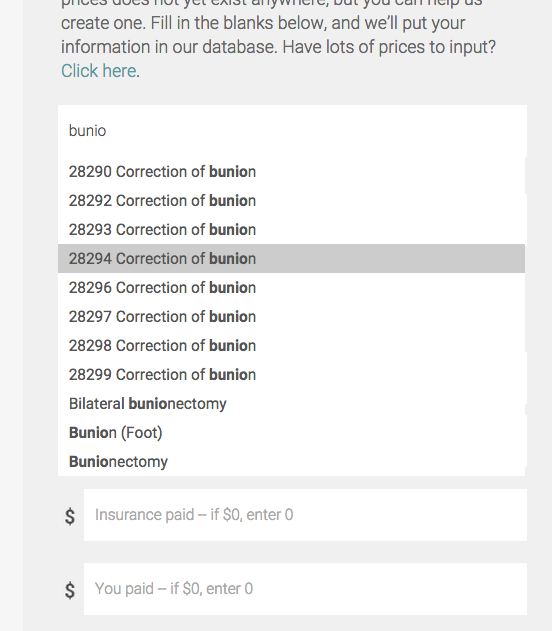 Here’s a description of the complexities of coding a bunion surgery. Q. I am a provider, and I am not in this database. A: The provider list comes from Google, and we are aware that it has some faults in it. The Google Places API that we are using is free, so we can’t go ask for our money back. Also in fact, many of the provider lists are out of date in health care – there are a lot of mergers and acquisitions and so on. Good news: You can go to this page and download our spreadsheet template and send it on in if you have lots of prices to share. Generally here are the data points. Email to info@clearhealthcosts.com with “MedPage Pricecheck data share” in the subject line. Q. I tried to enter my information, but it didn’t seem to work. A. Two points: First, We will be able to enter your data manually, and second, can you help us figure out what went wrong? A small number of the shares are not working properly. On the first point: if you would feel comfortable in sharing via email, here are the data points: If you return this to us, we’ll put it in for you! Bug (mandatory) or feature (optional)? What it does—be as explicit as possible. What you would like it to do–be as explicit as possible. Tell us what device, operating system, browser–be explicit (MacBook Air, OS X 10.6.8, Chrome build 40.0.2214.93 64-bit or iPhone 5S, IOS 7, Safari). Pictures are great, so if you can attach screenshots, documents and so on, that’s ideal. Arrows are helpful. Email to info@clearhealthcosts.com with “PriceCheck bug report” in subject line. Q. What prices are you interested in? We do a lot of different procedures. A: We are interested in all prices. We’re focusing early in our project on colonoscopies and echocardiograms with Doppler, because they’re more or less apples to apples, but we built the software to let you tell us what you’re interested in. We’ll be expanding our reporting depending on what we learn and what you tell us you’re interested in. Q: What about quality? We’re better than anybody else. A: We believe you. But there should be some better way than you telling us you’re great. Quality measurements for health care providers, hospitals, surgical centers and so on are a hot topic. Everybody’s got a favorite source (Yelp? healthgrades.com? AHRQ? Leapfrog? Consumer Reports? U.S. News and World Report? HEDIS? HCAHPS? your insurance company’s quality rankings? Your Facebook friends?) but the bottom line seems to be this: There’s a cacophony of competing sources of measurement, none of them definitive or over-arching. So we were interested to see this recent study revealing the outcome of the latest government effort to resolve the problem, as described by Alexandra Robbins in The Atlantic. The Department of Health and Human Services is wrestling with this, and to hear Robbins tell it, they labored mightily and brought forth a mouse. If you have a favorite quality supplier, please tell us — and tell us why they are better than others. From where we sit, there’s not much that is really actionable by individuals, or accepted and embraced by the clinician world. We do indeed hope and believe that providers, who should know quality metrics better than anybody, will unite to fix this problem. Because price without quality is incomplete. In our view, bringing price out of the shadows speeds a thoughtful quality discussion: What makes that $6,000 MRI so much better than the $300 one? Q. What about value-based care or high-value care? That’s what the future is. A. We agree that both quality and cost are needed to determine value. The answer just above talks about quality metrics: It’s often a question of who decides quality: the provider, the provider’s employer, the insurer, the government, the patient? What if the patient thinks it’s low-quality care and the provider doesn’t agree? Or the insurer thinks it’s high-quality care but the provider doesn’t agree? Q. My lawyer says this is illegal. A. We would never recommend that you contradict your lawyer. We are journalists, not lawyers. That said, we have investigated the question of posting cash prices, and there’s nothing illegal about it, though there are certain criteria. Here’s a blog post explaining the lay of the land as we see it. We have heard from clinicians who say definitively that their practice has no cash or self-pay price, while we have already received a cash or self-pay price from their billing office. We have heard from clinicians who say that they cannot reveal their cash prices, but that they routinely discount for cash customers. So we judge that perspectives may differ on this. If you have further details, or if you would like to connect us with your lawyers or with academics or others who have different perspectives, then we welcome that. Please email us at info@clearhealthcosts.com or e.chu@medpagetoday.com. Q. Really, it’s illegal. Nobody does this. A. We have collected cash or self-pay prices via a direct provider survey for several years. On our front page, you can see our prices, and links to other price lists of 30-35 common, “shoppable” procedures in the New York area; we also have pricing from seven other metro areas, which you can access via the search box at the top of the front page. Also, here’s a blog post with a link to our database of cash or self-pay prices posted online or reported directly to us by about 120 hospitals and surgical care centers. Click on the “notes” field in the database to see the pricing policy of the institution in question. Also, as you probably know, the retail health sector is booming – Wal-Mart, CVS, Walgreen’s and others have walk-in centers. They post prices online. Here’s an example from CVS, and here’s one from Walgreen’s. We can point to many others. Q. Why would anyone care about a cash or self-pay price? Now that insurance is extended to many – if not all – under the Affordable Care Act, isn’t everybody paying a slight copay or co-insurance, so the cash price matters not a bit to anyone? A: First, not everyone is insured. And not all providers are in network. Also, with rising deductibles and rising coinsurance, much more of the price is being paid by insured people. Also, if you’re responsible for co-insurance of, say, 20 percent on a procedure, you might want to know if you’re paying 20 percent of $300 or 20 percent of $6,000. Of course, if you haven’t met your deductible, you may be paying full freight, even perhaps the chargemaster price. That’s right: insured people are paying the chargemaster price. Some of them might prefer to pay a lower, cash or self-pay rate. Here’s a blog post about that. We heard of one insurance company whose online pricing tool explains the coinsurance for simple procedures: an MRI, for example, in our New York City backyard could cost $42.50 in coinsurance, or $253. Since coinsurance is 10 percent, that also reveals the reimbursement rate by the insurance company. Here’s a blog post about that. There are a number of reasons that people might be interested in the cash or self-pay price, including the question of whether their insurance premiums are giving them access to the highest rate, rather than the lowest, until they have met their deductible. Q: Has anybody ever done this before? A: In reporting on this issue, we journalists from Clearhealthcosts.com have already partnered with public radio stations in San Francisco, Los Angeles, New York City and the Delaware Valley (Philadelphia) to build community-created databases of prices, and to do in-depth reporting on this issue. Click the links for examples. Also, here’s some of the coverage of the California partnership, including links to our Harvard Business Review/New England Journal of Medicine coverage, and our JAMA Internal Medicine coverage, as well as NPR and other coverage. We have collected cash or self-pay prices at Clearhealthcosts.com via a direct provider survey for several years. On the front page of our website, you can see links to our price lists of 30-35 common, “shoppable” procedures in the New York area; we also have pricing from seven other metro areas, which you can access via the search box at the top of the front page. That search tool also gives you the Medicare reimbursement rate for any one of the 8,400 procedures in the government’s Medicare reimbursement data set, in any U.S. locale. Q: O.K., I’m in. What did you want me to do again? A: To contribute to or search our PriceCheck database, click here to go to the page displaying the form for entering and searching the data. If you have lots of prices to contribute, you can download our handy spreadsheet on this page. Q. I have a suggestion/question/comment that you didn’t address here. Here’s the full launch blog post, and here’s our data geek post about what’s in the database. Anything else: email us at info@clearhealthcosts.com or e.chu@medpagetoday.com.